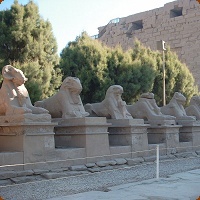 The Egyptian Minister of State has recently announced that the ancient Avenue of Sphinxes connecting Luxor and Karnak shall be reintroduced to the public in March. Luxor was once the city of Thebes as well as the city of the god Amon-Ra. In the 15th century B.C. Queen Hatshepsut built six chapels there, dedicated to the god, that became part of the avenue, which was 2.7 km long and featured hundreds of sphinxes.